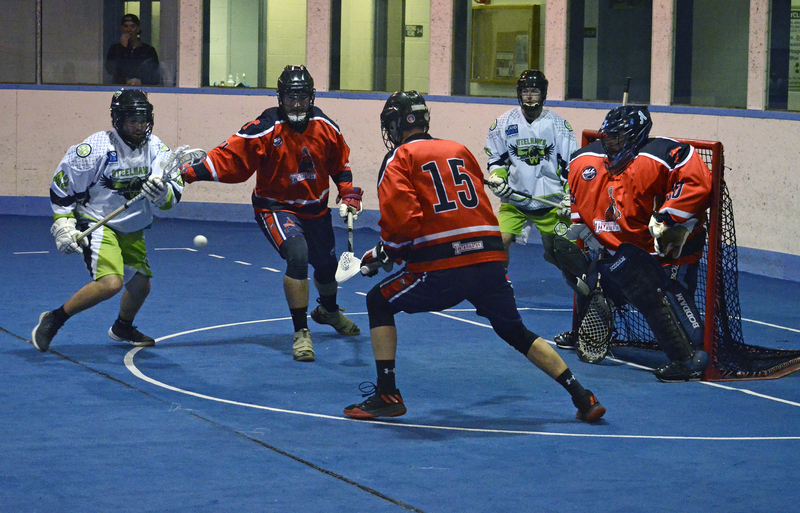 After six weeks of Arena Lacrosse League play, the St. Catharines Shockwave are still at the top of the standings with a 5-0 record. The Peterborough Timbermen and Toronto Monarchs are in second place with 4-1 and 4-2 records, respectively. The Shockwave were able to retain their lead despite having a bye week. Each team only plays 14 games so there’s not a lot of time to make a splash in the standings. Peterborough and Toronto are only two points behind St. Catharines, and the Oshawa Outlaws and Paris RiverWolves are only two points behind them. The Six Nations Snipers currently occupy sixth place. In last place, the defending champion the Whitby Steelhawks are suffering from the loss of JP Kealey, Blaze Riorden, Chris Boushy and Jordi-Jones Smith to the NLL, as well as Austin Murphy. Additionally, veteran defenseman Mark Farthing is currently injured, so there are lot of holes the Steelhawks are having trouble filling and their 0-6 record shows it. The Steelhawks took a hopeful 3-0 lead and led 5-4 after the first, but some stellar play by goaltender Nick Damude allowed the Timbermen to score 11 in a row between the second and third. Whitby was only able to score three times in the second half of play. The highlight of the game was defenseman Joe Wasson’s goal in which he grabbed a loose ball, spun around and rifled a sharp angle shot into Whitby’s net.Mark Vradenburg led the Timbermben with four goals and two assists. Colton Armstrong, Cameron Simpson and Fred Hartley each recorded a hat trick. Creek Blakely and Luke Pilcher each had two goals and two helpers for Whitby. Six Nations led 2-0 early before the Outlaws came back to lead 3-2 after the first. A big second from the Outlaws put them up 10-5 at half but the Snipers battled to keep the score close heading into the fourth. They eventually tied the game at 14 and even took a one-goal lead on Richard Imus’ goal at 7:39. But league-leading scorer John St. John had the last laugh, tying the game for the Outlaws and then winning it. Captain Mike Triolo added a late insurance marker. Luke Laszkiewicz was on fire for the Outlaws, scoring seven times and adding two assists. St. John totaled four goals and five assists. Rance Vigneux picked up the win in goal. Ian Martin led the Snipers with a pair of goals and three assists. The Monarchs and RiverWolves played each other closely in the first quarter, tying twice. However, the Monarchs took a 6-4 lead by the end of the frame and led the rest of the way. Paris only managed a single goal to every two Toronto scored and only managed a single tally in the fourth quarter. Sam Postma scored a sock trick and a pair of helpers to lead the Monarchs. Eddie Renaud and Tanner Buck each had a hat trick and three assists. Craig Wende picked up the win. Connor Goodwin was the main man for the shorthanded RiverWolves, picking up three goals and four assists.